Is Social Media Marketing worth the hype? Social Media Marketing has been quite in vogue since the onset of social media sites like Facebook, Twitter, MySpace and many others. Facebook and Twitter are largely being used by all types of big and small business organizations as a marketing tool. This latest technique is considered as a great way to enhance the interaction with customers. But is really social media marketing worth the hype? Well there are various points of views by different experts on this issue. Some think that social media doesn’t play the marketing role well enough and it is being used by only a small percentage of entrepreneurs all around the world. Because of the low cost or free advertisement on these sites, mostly small businesses use this approach much widely than bigger organizations. A different set of thoughtful experts argue that although it is a new way to advertise and promote your products but social media actually plays a smart role in developing a loyal customer following even for bigger organizations. The low cost advantage will stay there for almost any entrepreneur making these sites one of the best tools. Well obviously, the users on such sites have increased to billions over the recent years. And if you put a constant effort of promoting your brand to such a diverse customer range, you are definitely going to reap the benefits. But there should be a constant and systematic approach to the social media marketing. It is not for people who try once and twice to give up because they don’t have the patience and time. It is for people who are consistent, have something amazing to offer and believe that they can make a great customer network through such sites. 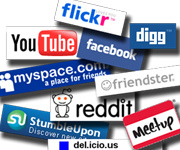 So what makes marketing work on these social sites? The basic customer first attitude and a great story that will attract people will stay the landmark like any other type of advertisement. Just because you managed to get 1000’s of “Likes” from users in return for some incentives or discounts does not mean your job is over. A company should take the social media networking as a direct communication between them and their customers. This is a great way to increase mutual understanding and insight. The best way to promote your products and services is to develop conversations with customers and making your presence felt on the social media. Be authentic and true in every update that you give and you will definitely win over loyal customers around the globe. If you talk with authenticity, there is a high chance that you will gain more followers through the network of your existing followers. Facebook, Twitter and Pinterest are definitely excellent sites to start marketing. But if you want to market to other businesses, LinkedIn is a great social website to focus on. Basically, you need to set your goals and use the social media systematically to achieve them. Social media marketing will surely bring some level of influence both directly and indirectly on your business.